For many of us, we have either just started to plant our gardens, or we will be very soon. This issue includes our Greenhouse Calendar, How to Keep Your Greenhouse Cool, Tips for Growing Garden Vegetables, Why Kids Eat What They Grow, The Greenhouse Kids Trilogy and more. Purchase a greenhouse or lean-to between May 15th and June 8th and get your greenhouse painted forest green or dark brown at no additional cost! Contact us today for your free quote. May is the ideal month to plan your summer garden. You can start seedlings in your greenhouse for the plants you will later want to move to your outdoor garden. The preparation of your greenhouse is the most important task leading up to the summer months. The humidity in the greenhouse should be raised, the plants watered more frequently and the plants fed more often. Keep the greenhouse well ventilated during the spring months to avoid mold and mildew problems. Greenhouse fruit and vegetable plants will now be in need of a little attention to ensure a successful harvest. The side-shoots of tomatoes should be removed. Pepper plants need to be transplanted. Taller plants will need suitable support for extra growth. Near the end May take cuttings of flowering annuals such as geraniums, that will provide flowers in the fall and winter months. Spring is a busy time in the greenhouse and with a little extra attention it will be possible to enjoy the start of the new growing season without any major problems and look forward to a productive summer ahead. Ventilation is one of the most important aspects of a successful greenhouse experience. By regulating the temperature within the greenhouse with proper ventilation, you ensure that your plants get plenty of fresh air so that they can photosynthesize. Also proper ventilation will stop pest infestations and will allow pollination to work within the greenhouse. Regardless of your geographical location, greenhouses can often become too hot causing plants to wilt and eventually die. Consider using an exhaust fan to push out the stale air and have plenty of vents to circulate the fresh air. The exhaust fan is typically placed near the roof of the greenhouse away from the door. Rotating fans within the greenhouse also help to circulate the air and to keep the temperatures down. Use your garden hose to hose the greenhouse down. The use of a cover such as shade cloth for the outside of the greenhouse is common during really hot periods as well as customized indoor shades. Use a good thermometer to regularly monitor temperatures within the greenhouse and make sure the air keeps flowing. With tomatoes in particular, make sure that you buy the seeds that are specially designated for greenhouse use. The seeds need to be sown and then transplanted into pots as they grow larger. Most vegetables need at least six hours of sun daily. Lettuce, peas carrots and kale need much less sun than vegetables that produce fruit like tomatoes, peppers, eggplant and squash which need full sun. Try to use the freshest soil each season using compost and other organic matter regularly to get the best results. Learn which plants need more water than others. Too little water will not let plant roots grow deep enough to gather nutrients for growth. Too much water will not allow the plant air and space needed to grow. All plants need more water during the months of June-August. Different varieties of vegetables need proper spacing when planting the seeds. For example, lettuce needs to be spaced 8-10" apart while tomato plants should be spaced 24-36" apart. Some plants make better companions than others. For example, broccoli grows friendly with beans, beets, carrots, celery and cucumbers. For some parents, getting kids to eat vegetables is an ongoing challenge. Want the perfect way to encourage them to eat more vegetables? Help them to grow their own! Tasting home grown vegetables is so much better and more flavorful than those you buy in a store. Help your child to choose the seeds, plant them and eventually harvest them. The time it takes to nurture a plant will build a quiet confidence and silent pride in your child especially when it is time to eat the home grown vegetables. Children especially find it fun to dig up carrots and potatoes and to pick cute little cherry tomatoes. Try growing your own vegetables with your kids. It is fun, educational and they will eat more! 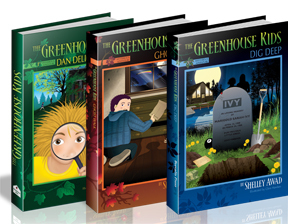 The Greenhouse Kids Trilogy by bestselling children's author, Shelley Awad, includes the following mysterious adventures - The Greenhouse Kids, Dan Delion's Secret; The Greenhouse Kids, Ghost Walk; The Greenhouse Kids, Dig Deep. In this chapter book series, plant life takes on a new and magical meaning. You will be taken on a fantastic journey with the garden-themed characters - Dan Delion, Holly Hocks, Johnny Jump-Ups, Foxy Gloves, Virginia Creeper and Snap Dragon. In the overgrown yard of the ivy-covered haunted mansion stands an eerie run-down greenhouse. It holds a magical secret. Dan Delion discovers this for himself on what seemed like a very usual "bug hunting" Saturday. Come along with The Greenhouse Kids as they learn the true meaning of friendship. Speedy Seedy, the school bully, brings them face to face with courage.do they have it or not? Mystery, fun, danger and laughter follow these amazing friends through each book as they experience the adventures of growing up. Now's your chance to get the Sun Garden greenhouse painted green or brown for the same price as painted white! This is a limited time offer based on a first come/first serve basis while supplies last. For more info on the Sun Garden Greenhouse, please visit http://backyardgreenhouses.com/sungarden.